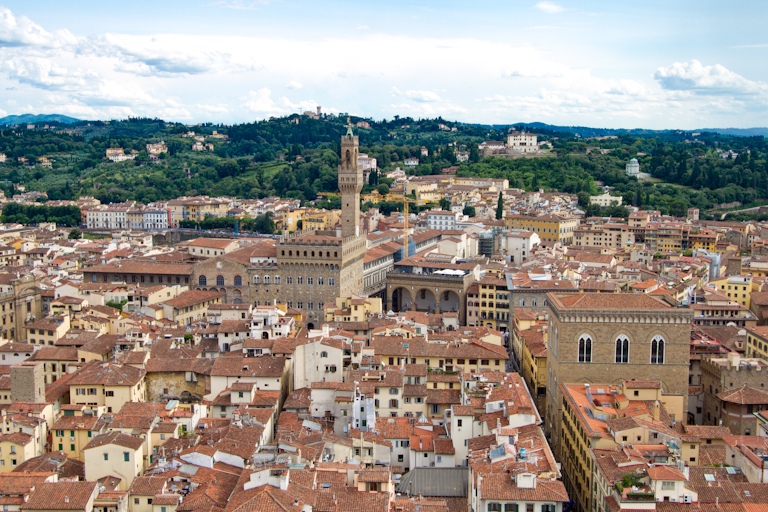 Today we're traveling up north to Florence! 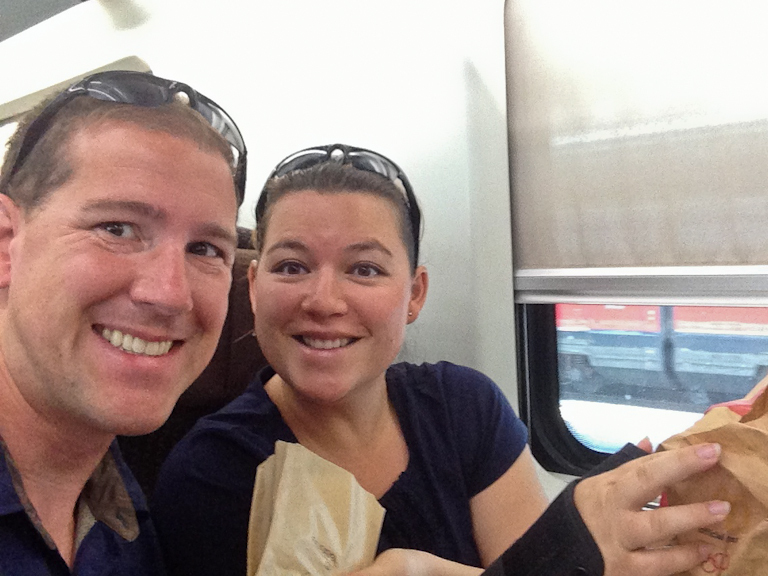 It's 175 miles north of our current location, so we'll be taking the train to get there. Here's all the places we went during the day. Last night Theresa and I both slept restlessly. Maybe it was the anticipation of getting up the next morning. The alarm went off at 9am and we didn’t linger in bed. 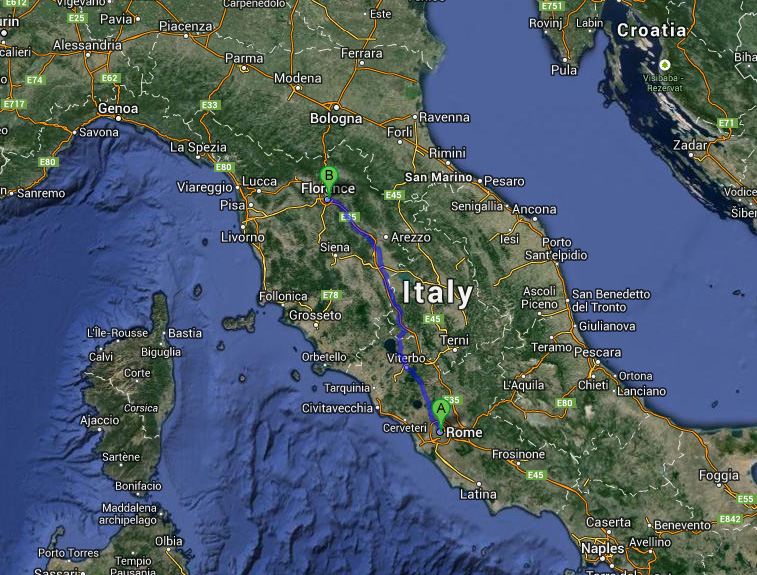 Today we’ve got to catch a train to Florence for the next part of our journey. After packing mostly the night before, we didn’t take long to get everything together in the morning. Checking out was easy and we saw Roberta and thanked her again for her help the day we arrived. They called a cab for us, and it was as simple as them pressing a button on a machine behind the counter. We received a ticket showing the driver was on his way, his name, the cab number and his estimated arrival time. Pretty slick. The taxi arrived after just a couple minutes and we loaded up to head to Termini station. We could have walked it or taken a bus, but with luggage, it was easier to get the cab. Thankfully we had a great driver who didn’t gun it, always stopped smoothly, and didn’t whip around the lanes. Theresa was very thankful so for our 11 Euro fare, I had no problem giving him 15 Euro. 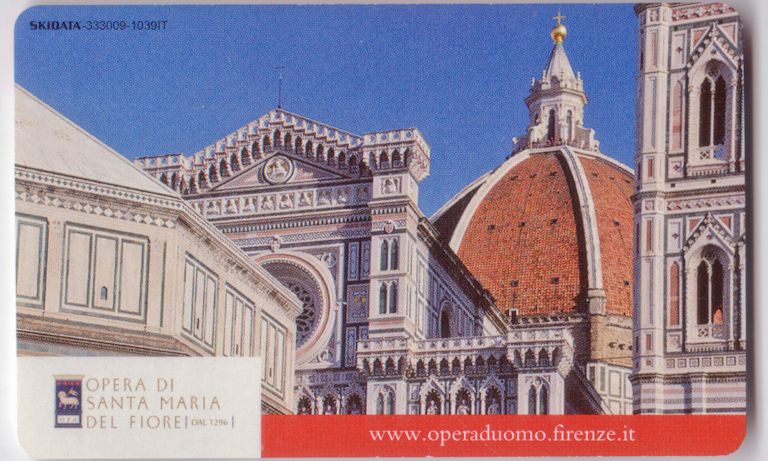 We entered Termini and found a green and white ticket machine and bought tickets for the 10:20am train to Florence. For 43 Euro each we got coach seats. It’s 10am now, so we’ve got just a little time for breakfast. We stopped at the McDonalds inside the station. T got two cheeseburgers (yes, for breakfast), but I wanted to try the local specialty. I’ve had a teriyaki burger at a Japanese McDonalds. Now I can say I’ve had the Pizzarotto from McDonalds. Just like the Teriyaki burger, it wasn’t very good and apparently not many people order it because it took a while to get. We kept looking at the time thinking in a minute or two we’re going to just have to leave it. 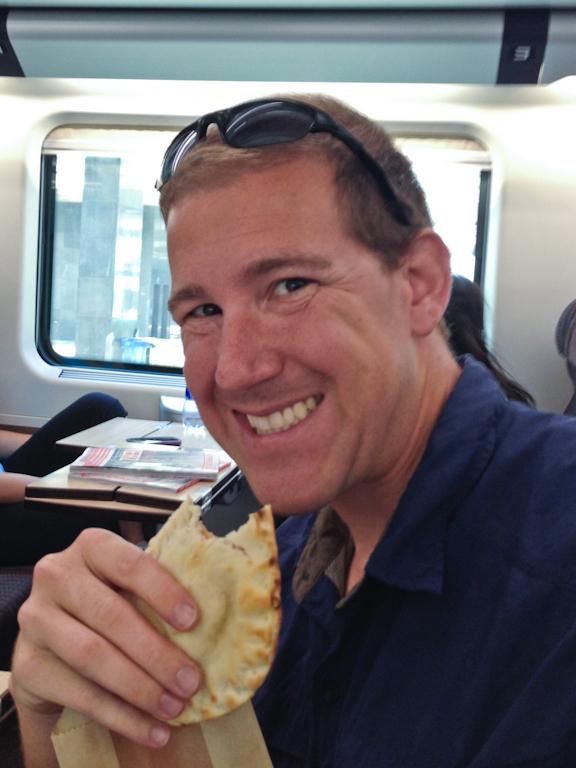 We got our food around 10:15am and rushed off to the train. After confirming with the conductor that we were on the right track, we jumped in the first available car. Not knowing if trains leave a little early or right on time, we were taking any chances. We walked through the cars from the first class, through business class, back to the coach cars, with me hauling my bag, my photo bag, and Theresa’s luggage. The tickets say they're for reserved seats, but I don’t think anyone pays attention to that. We picked a spot that looked good with seats facing the direction we’re moving (a must for T) and lucked out that no one sat opposite us. At 10:22am we started moving. 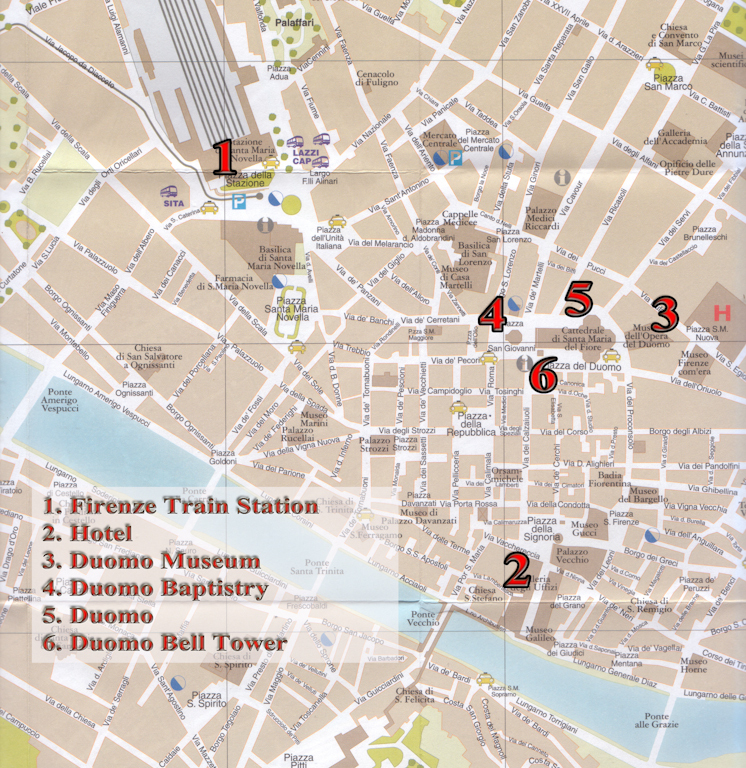 During the journey we planned out our time in Florence in more detail. 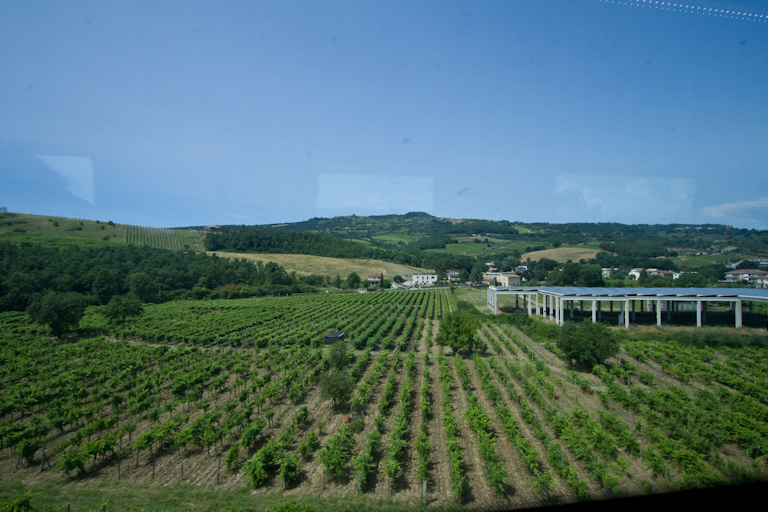 We also got to see some of the nice Italian countryside with grape vines, rolling hills, and castles and churches built overlooking the valleys. Speeds on the train topped out at 250 km/hr (150 mph) so we were booking it. The tunnels though causes our ears to pop and T mentioned that taking a child on here wouldn’t be fun. Something we'll have to keep in mind on future trips. 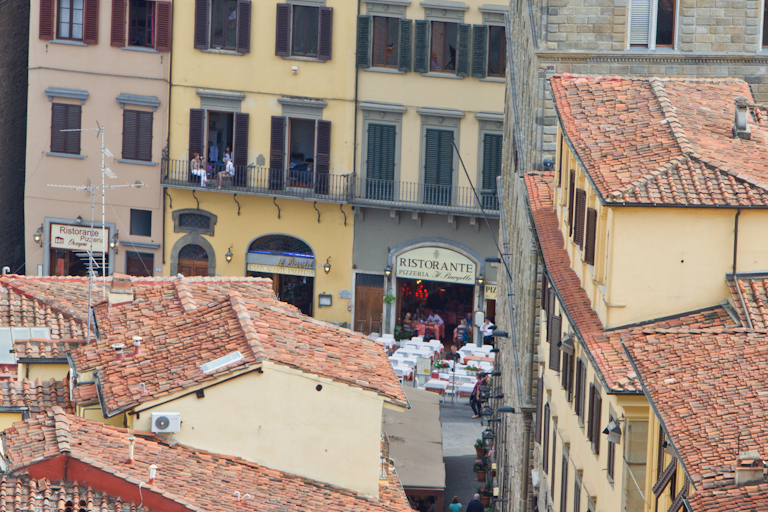 In just an hour and a half, we arrived in Florence around 11:50am. We were rushing this morning because at the bed and breakfast we’re staying at the staff leaves at 1pm and it's more difficult to get inside if you arrive late. We found the line for taxis and directed the driver to Piazza de Signora. He asked for an address, but we just told him to drop us off close and we’d walk it. Again we got lucky with a careful driver and Theresa arrived headache free. On an 8.10 Euro fare, I gave the guy 10 Euro and he was pretty happy with it, and gave us an extra map. It’s so awesome we’re staying right here in this square. 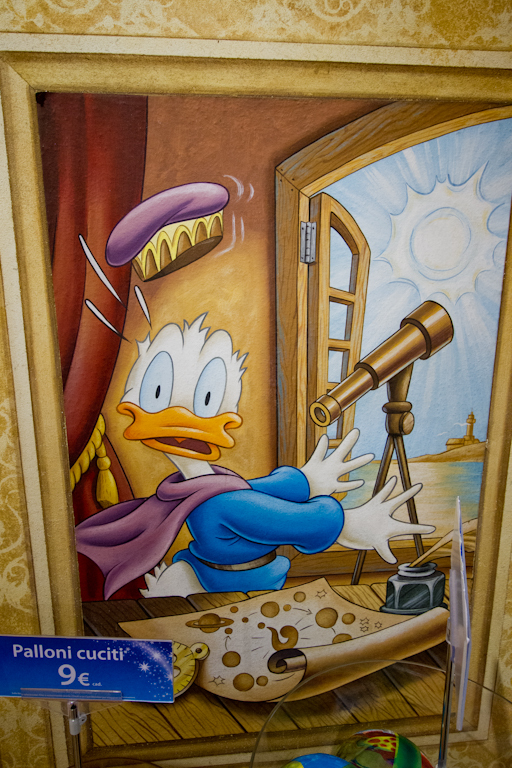 I remember it from the last time we visited. To find the bed and breakfast, we had to look for two restaurants. There is a door in the middle that we buzz into and head up a few stairs. We buzzed in and I carried both our bags up 4 flights of stairs to the entrance. Costanza greeted us at the door and walked us to our room. It’s a nice little bed and breakfast. Not too fancy, but not a dump either. 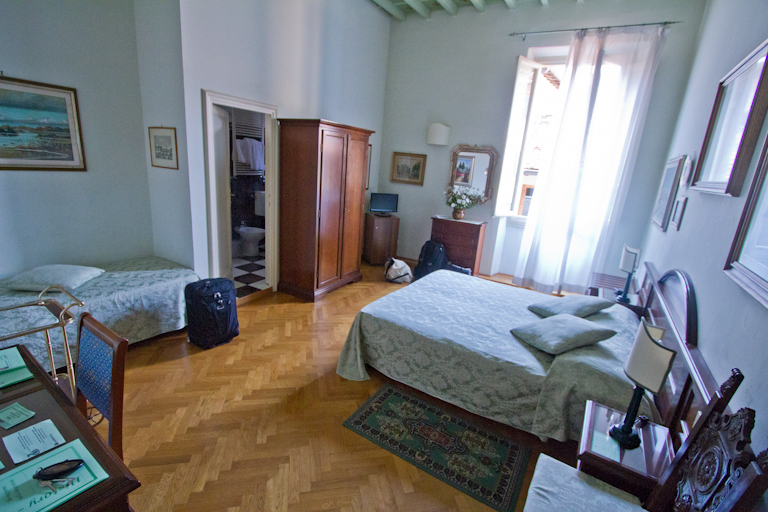 The room looks decent, though they’ve got the smallest flat screen TV I’ve seen in a long time. We dropped our luggage and kept the door and window open to let the room air out a little. 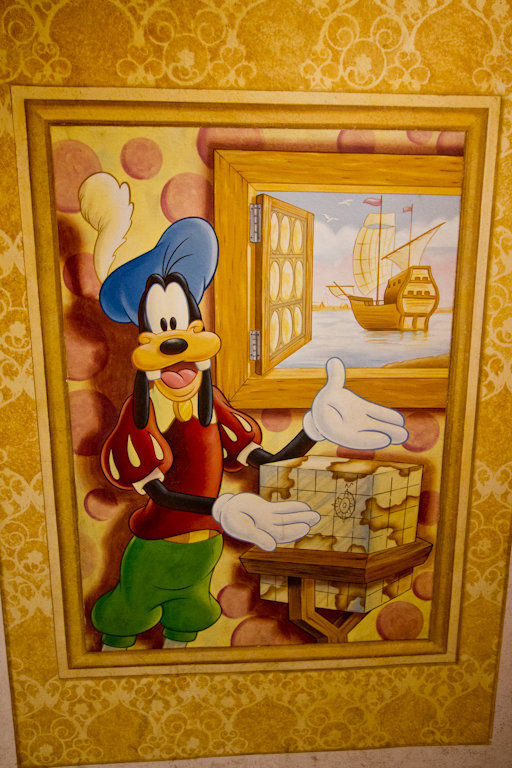 When we opened the window of our room, we were bombarded with the aroma of pizza, and it smelled delicious! 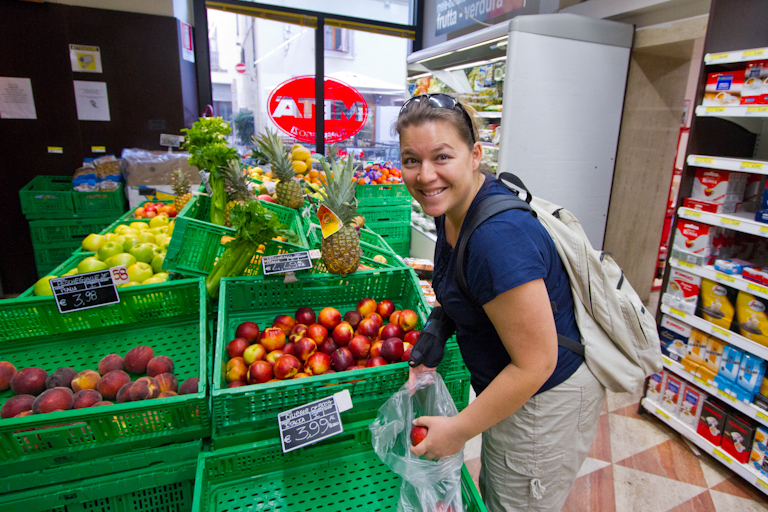 We then went back to the main entrance/reception and Costanza showed us some good places to eat, buy groceries, etc. 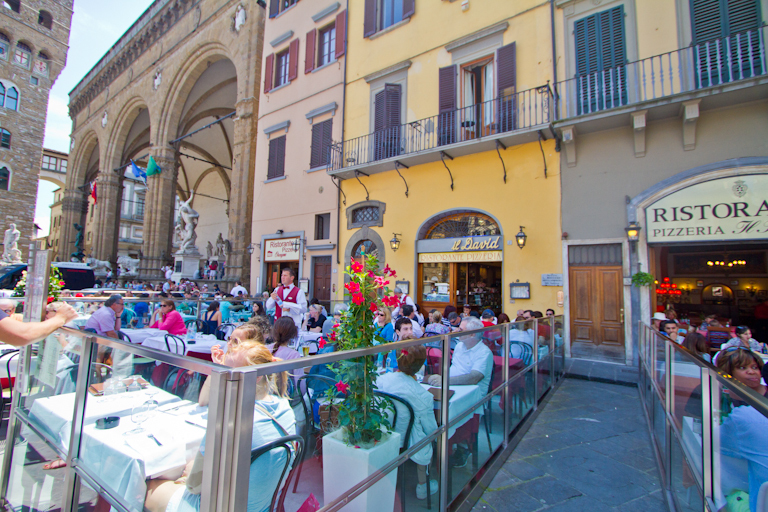 She said Tuscany isn’t known so much for their pastas, as they are for their steak and their soap. Huh? Our soap, mimicking spooning something from a bowl. Ohhh, soup. She also told us about a restaurant where they serve 1 kg T bone steaks that are super thick! My kind of place! We asked if they knew where that wonderful pizza smell was coming from and they said it was from a restaurant just downstairs. But they said, the smell yes, the… how do you say… flavor and taste, no. She said it's just frozen pizza they heat up. Instead they recommended another place to go for pizza. A few minutes after dropping off our bags, off we went to explore the city. 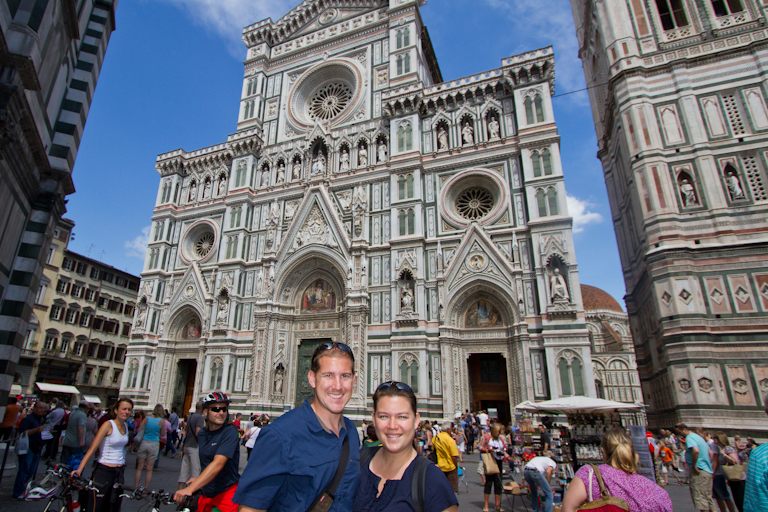 We’re planning on buying the Firenze pass which is good for 72 hours at most sites. One of the main sites it’s not good at though is the Duomo and associated sites with the Duomo, so we're going there today. 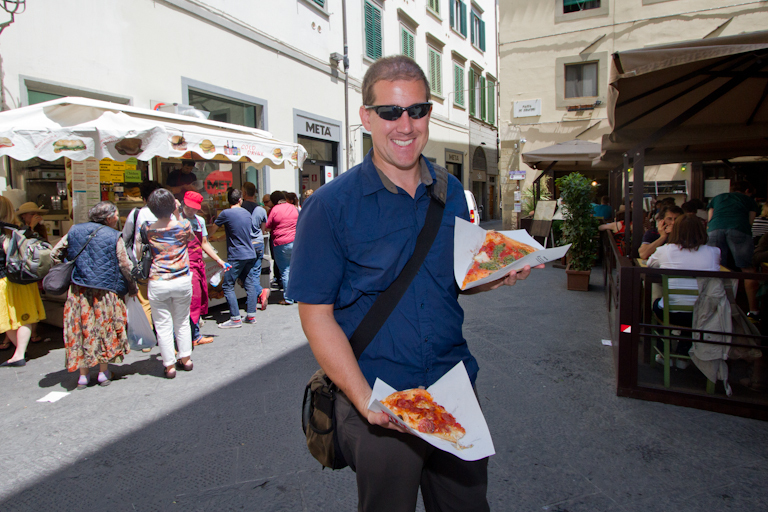 We walked in that direction and on the way, found a place that sells pizza by the slice and was recommended by Rick Steves. Only 2.50 Euro per slice so T got pepperoni and I got tomato, mozzarella, and pesto. Not liking the cheese or pepperoni, Theresa scraped all hers onto mine and just ate the pizza with whatever pizza sauce was left on it. Fine by me! 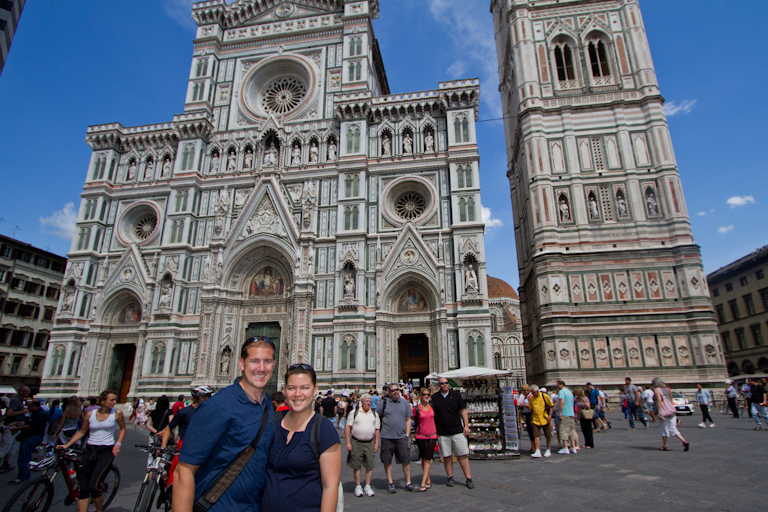 Not sure where to start, we walked to the Baptistry. 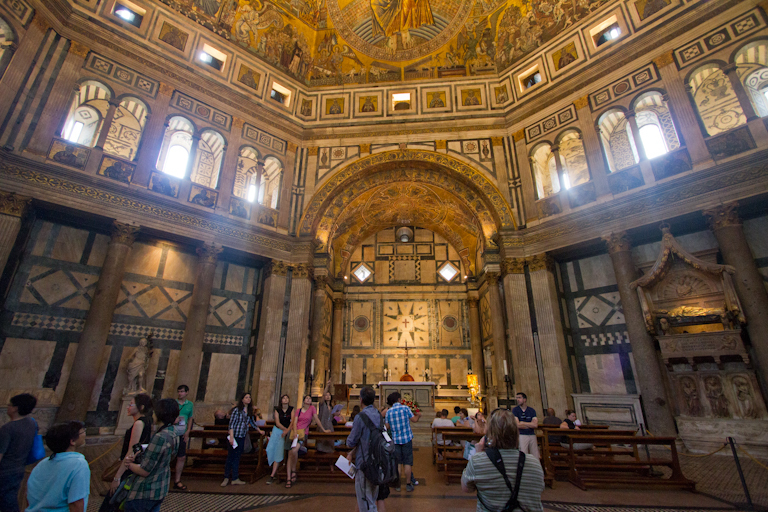 On the outside of the Baptistry are the Gates of Paradise, which always draws a crowd. 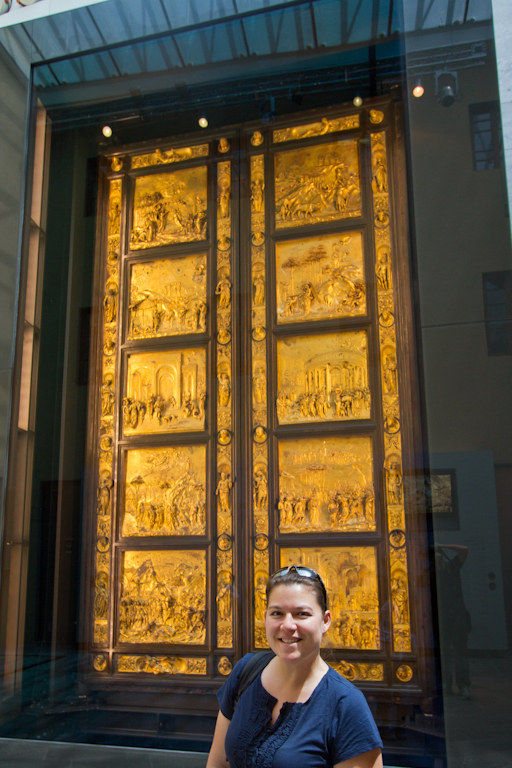 They were named this because when Michelangelo saw them he said these doors are fit to be the "Gates of Paradise". Looks like everyone who’s going in already has tickets. Alright, let’s go find tickets. I know they sell them at the Duomo Museum. On the way there we saw a Lindt chocolate store. I have been looking for a particular chocolate since the last time we were in Germany. I can’t remember the maker anymore, but it was regular milk chocolate with bits of honey in it. No other nuts or anything else. Just chocolate and honey. 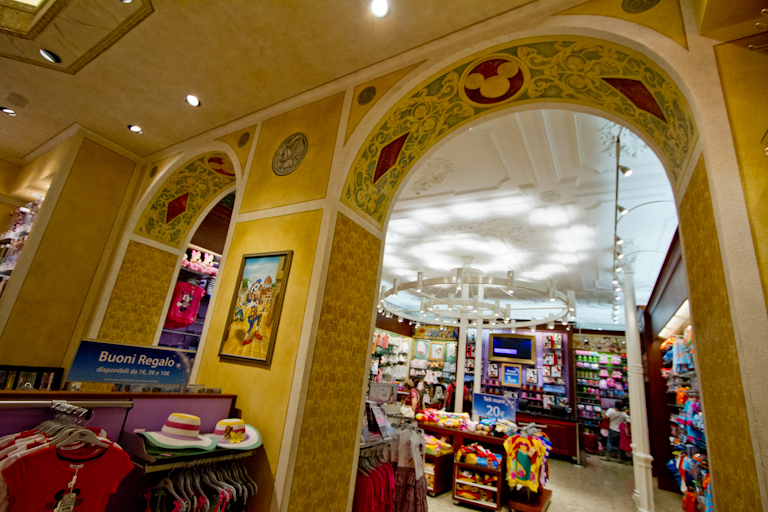 Hoping we’d find it here, we went inside and saw over 20 different types of chocolates, but no honey. We’ll keep looking then (and if anyone has any more info, I would definitely appreciate it). 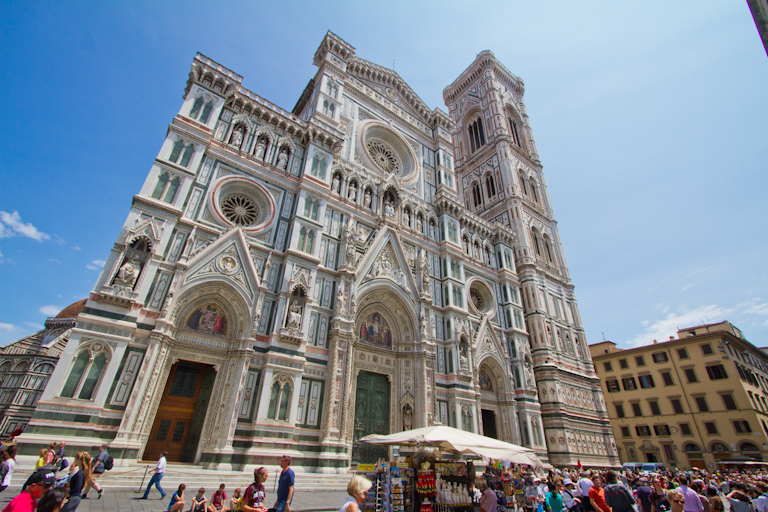 The Duomo museum is just behind the church itself. We were expecting to pay 15 Euro each for a 4 day combo ticket to get us into all the sites like the Rick Steves guidebook said, but lucked out in that they had a 1 day combo ticket for just 10 Euro each. 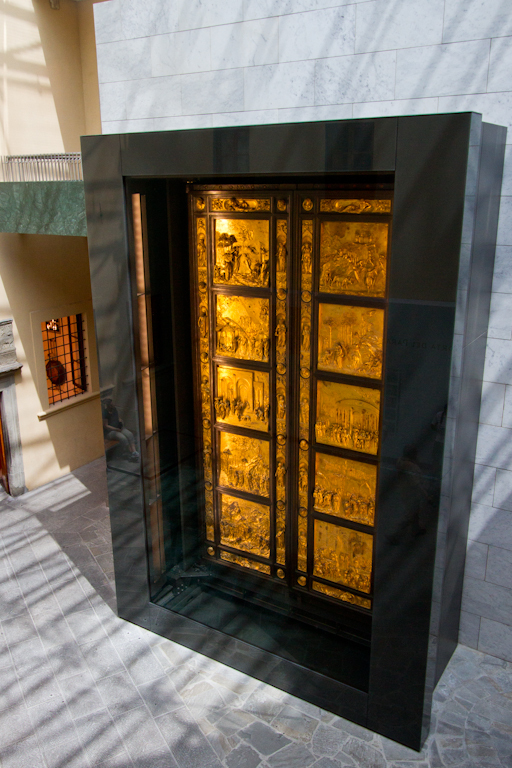 One of the first items you see as you enter are the original Gates of Paradise designed by Lorenzo Ghiberti in 1401, which took him 21 years to complete. 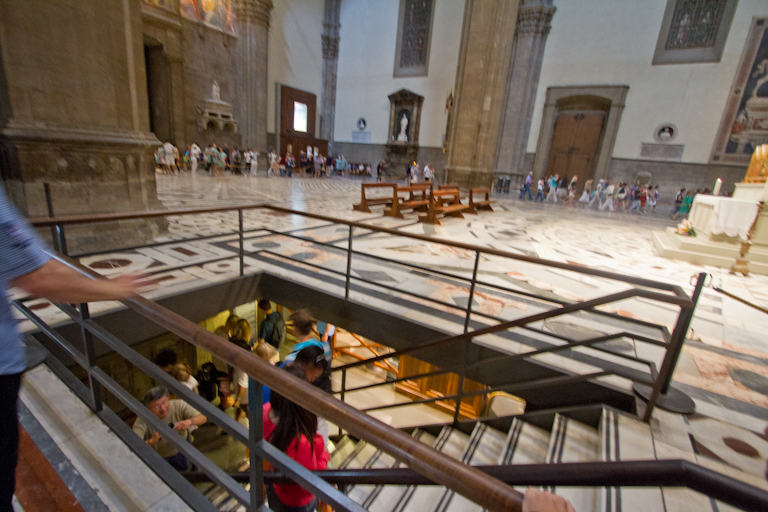 The doors hanging on the Baptistry now are copies for the tourists. 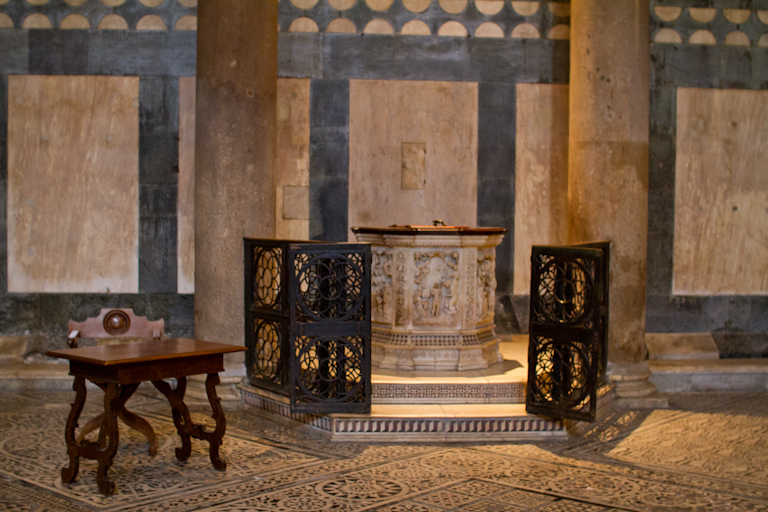 The original doors hung on the Baptistry until 1990, when they were removed for restoration. Centuries of deposits, salts, and flooding had tarnished these once golden doors. In the lobby of the museum was a video showing the restoration process. Check out the difference! 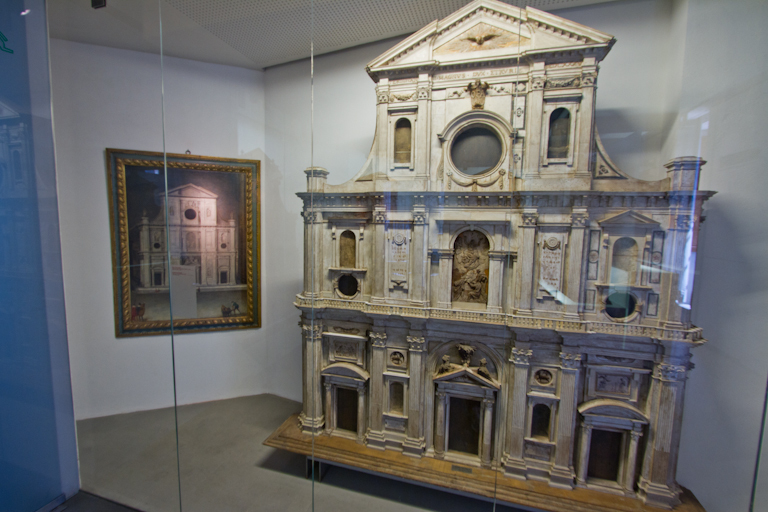 In 2010, having completed their restoration, they were placed in the Duomo Museum. 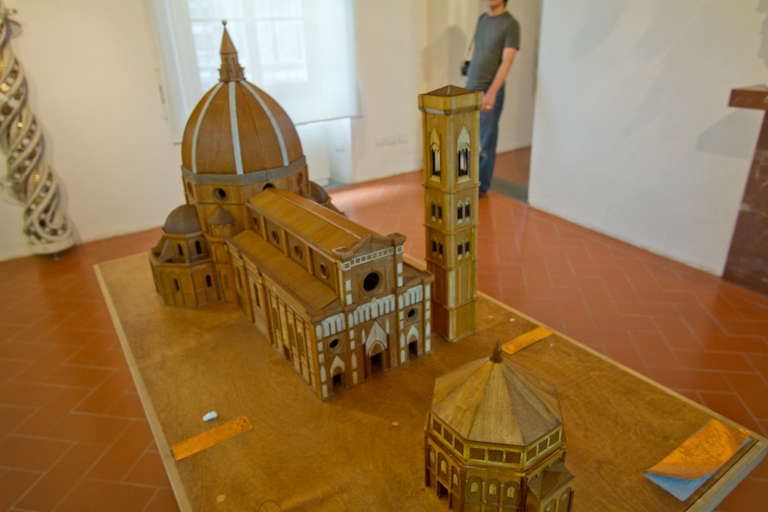 Inside the museum were also some of the models presented by artists trying to win the commission to build the cathedral. 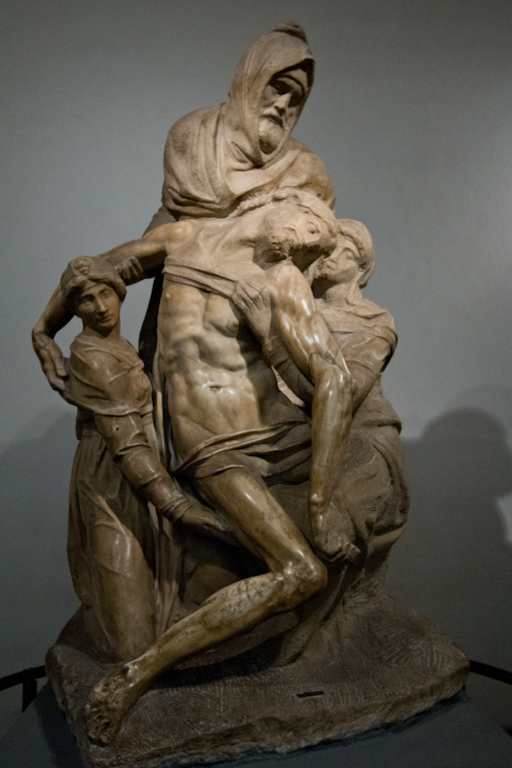 One of the more interesting sculptures here was The Deposition, also called the Florence Pieta, by Michelangelo. Michelangelo originally worked on this sculpture in 1543 when he was in his 70s. 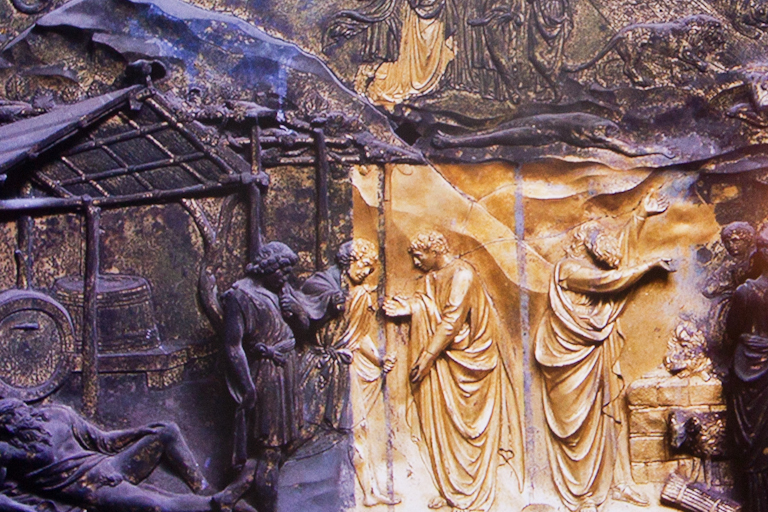 It shows Christ being lowered from the cross by his mother Mary, Mary Magdalene and Nicodemus. 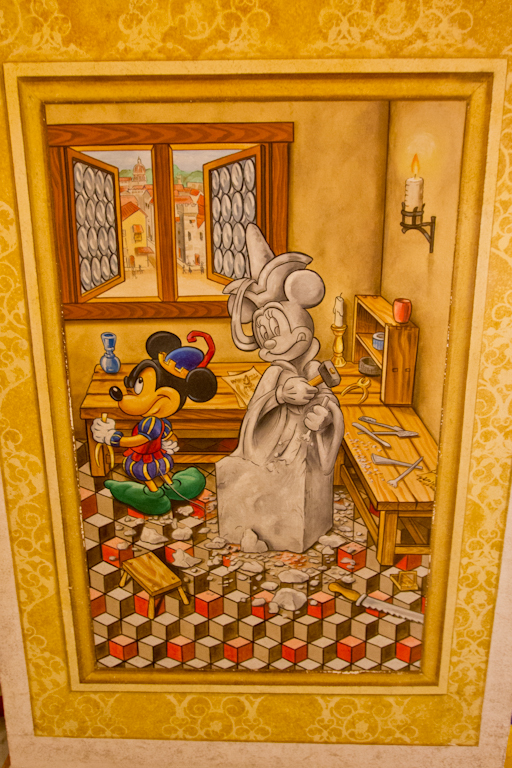 Michelangelo actually gave his own features to Nicodemus, who was also said to be a sculpture. After working on it for 8 years, Michelangelo discovered a flaw in the grain of the marble and was so frustrated that he took a hammer to it and broke off Christ's arm, leg and Mary's elbow. He left it mutilated and unfinished. 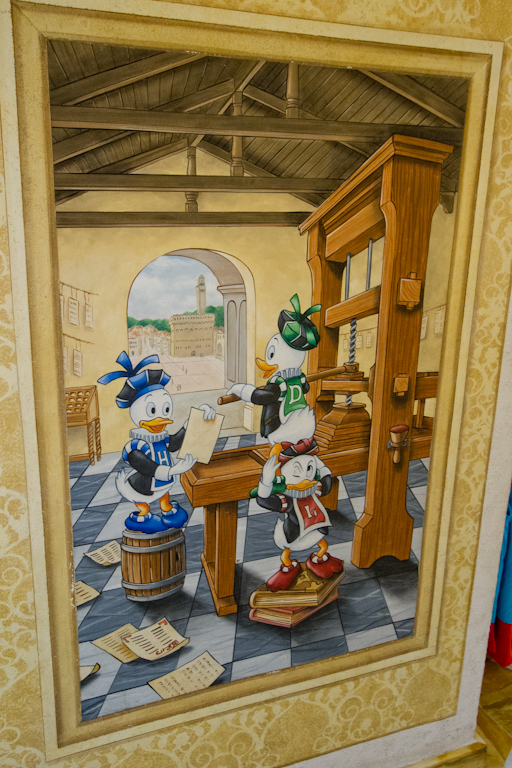 It was later restored by one of his students. Having already seen works by Michelangelo and Raphael on this trip, we can now claim a third Ninja Turtle. 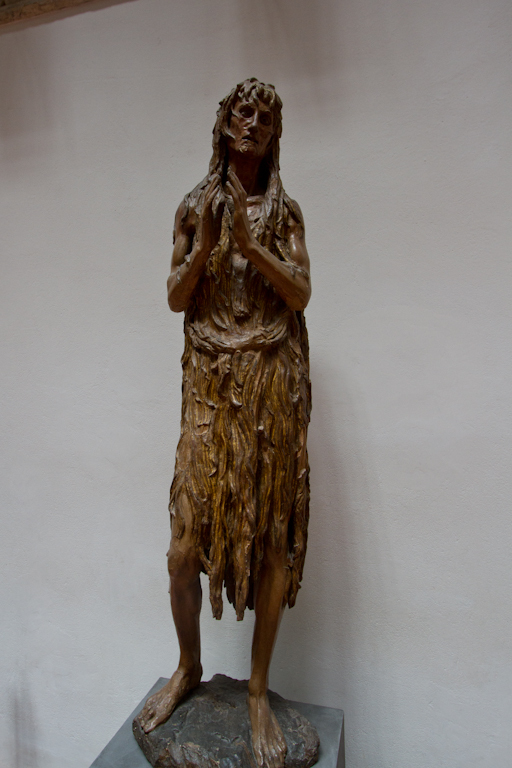 This wood carving called Magdalene Penitent was created by Donatello around 1453. Theresa and I both thought she looked a little scary. 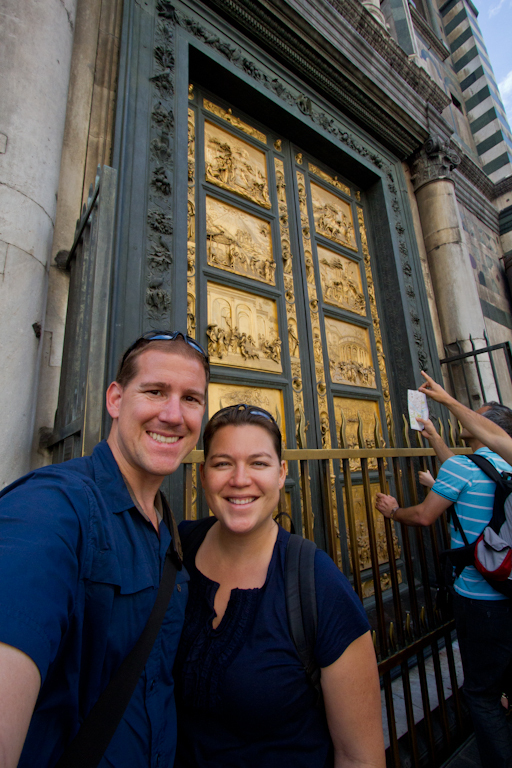 After one last look at the Gates of Paradise, we head out to the Baptistry. 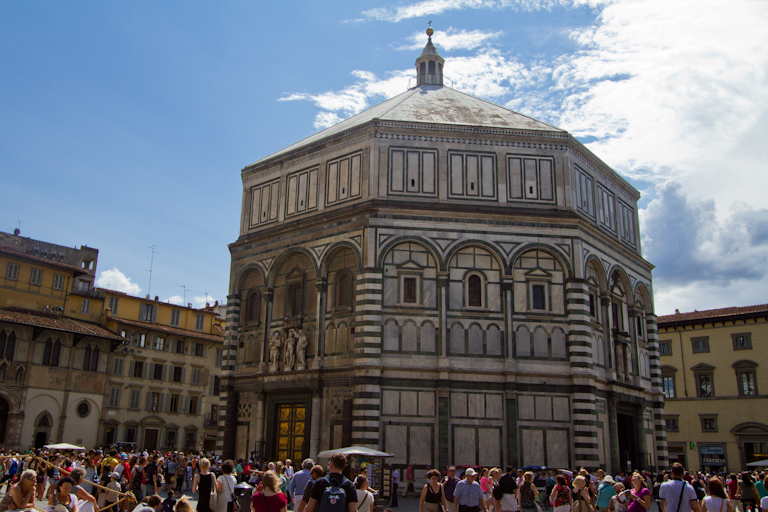 The Baptistry is one of the oldest buildings in Florence, having been built around 1059. 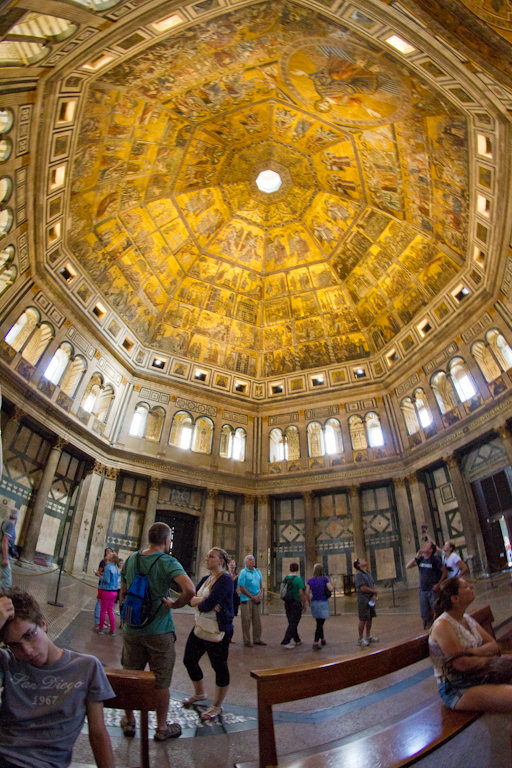 The previous baptistry was in the center of the structure. 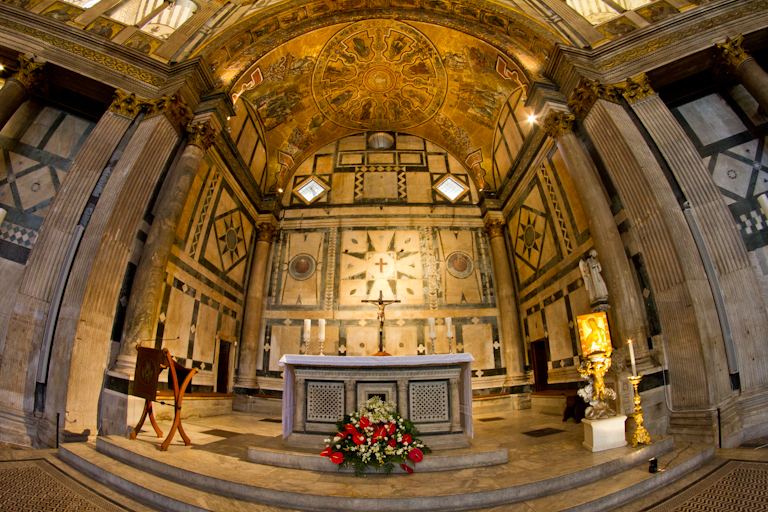 Many notable people were baptized here including Dante Alighieri (known for Dante's Inferno) and many members of the Medici family. Starting in 1568, a smaller font started being used for baptisms. Not the best 360 I've done, but it's all I've got. Probably the last time I try to use my fish-eye lens to create a panorama. 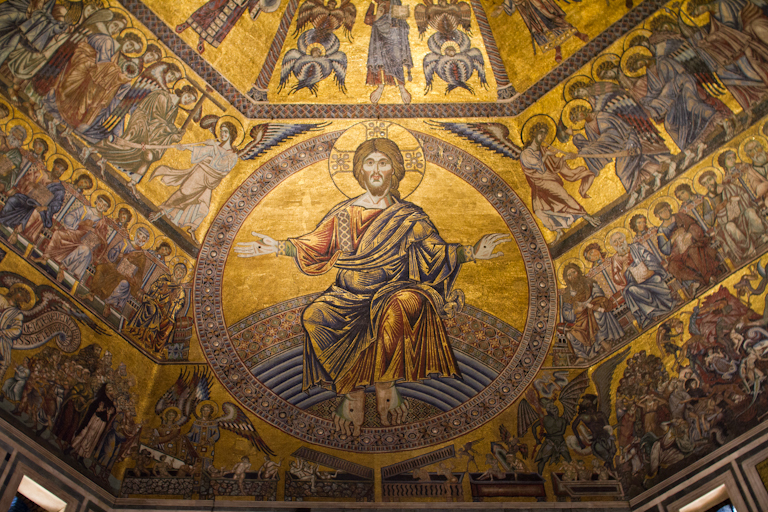 The mosaic ceiling above features the Last Judgement. 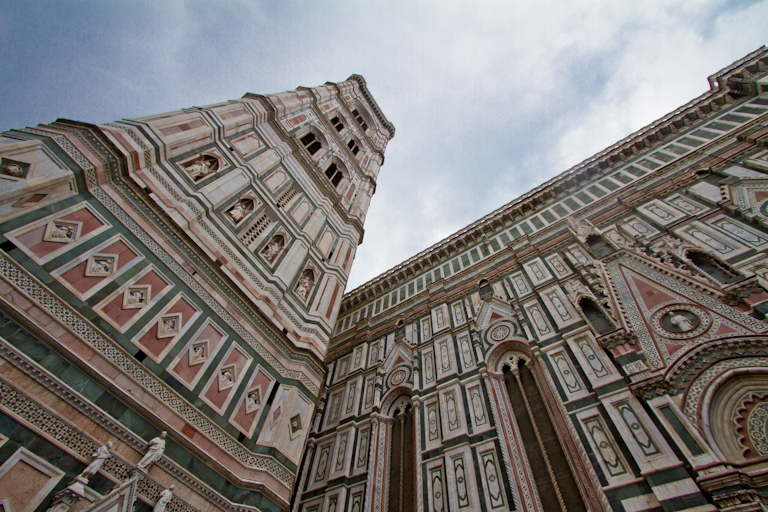 Next up, Il Duomo di Firenze. It’s free to enter but the line wasn’t too bad. Built in 1296, this cathedral was started before they even had the technology or know-how to build the dome to cap it off. 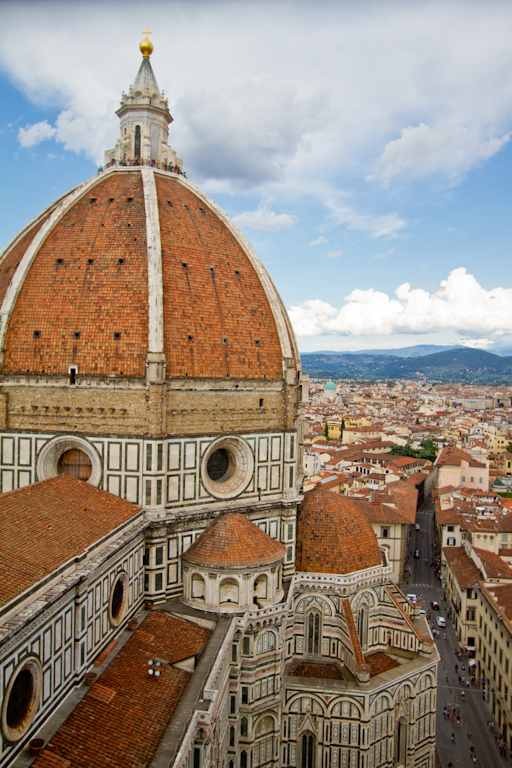 It wasn't until 1420, nearly 125 years later that work on the dome finally began. After seeing St Peters and other cathedrals with decoration everywhere, I was surprised to see such a plain ceiling in the nave. The floor inside had some very interesting geometric shapes. Walking up to the front though, the Dome of the Duomo really impresses. 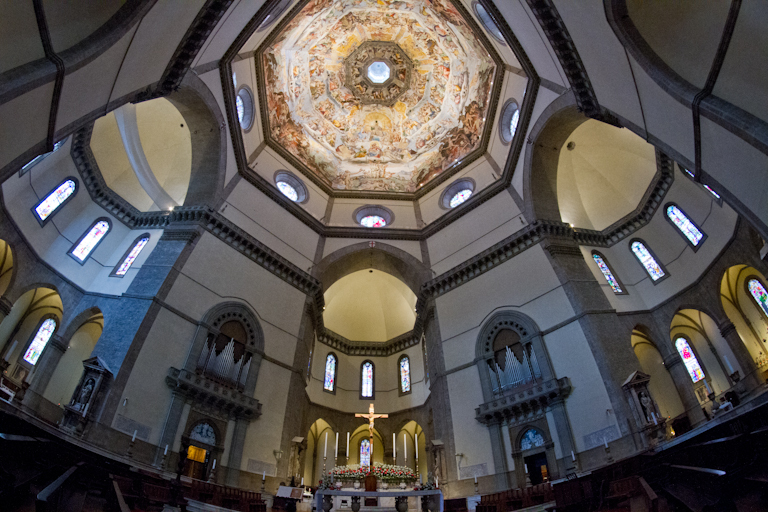 When Michelangelo was designing the dome of St Peters, he used this dome as inspiration. He said, I will build her sister bigger, but no more beautiful. 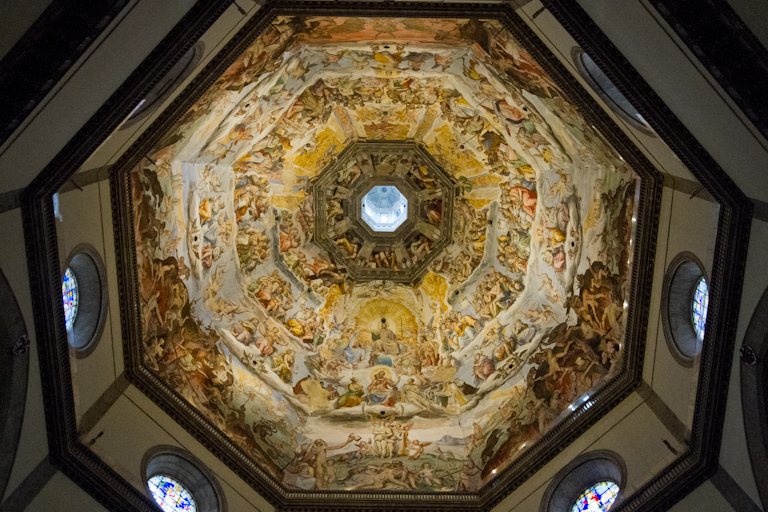 The interior of the dome covers almost 39,000 sq ft and was painted over 11 years by Giorgio Vasari and Federico Zuccari. At the back of the church, you can actually go down stairs and under the floor to see what the foundation and crypt looks like. 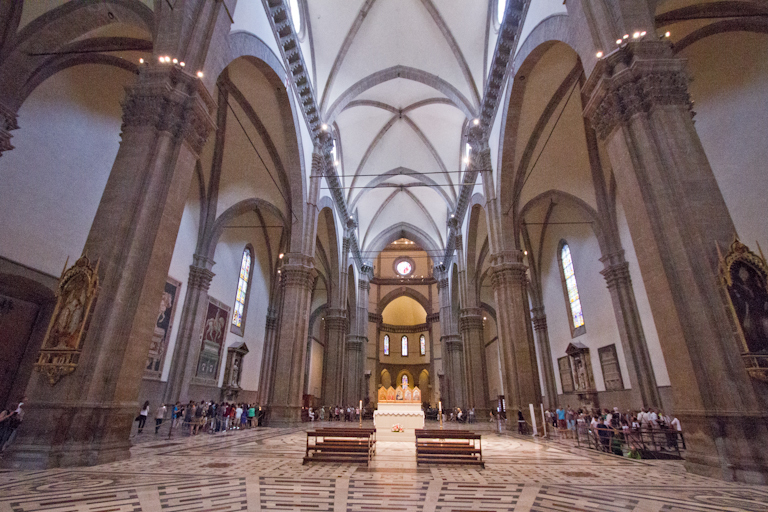 It was built on the ruins of another church and used as the burial site for Florentine bishops. 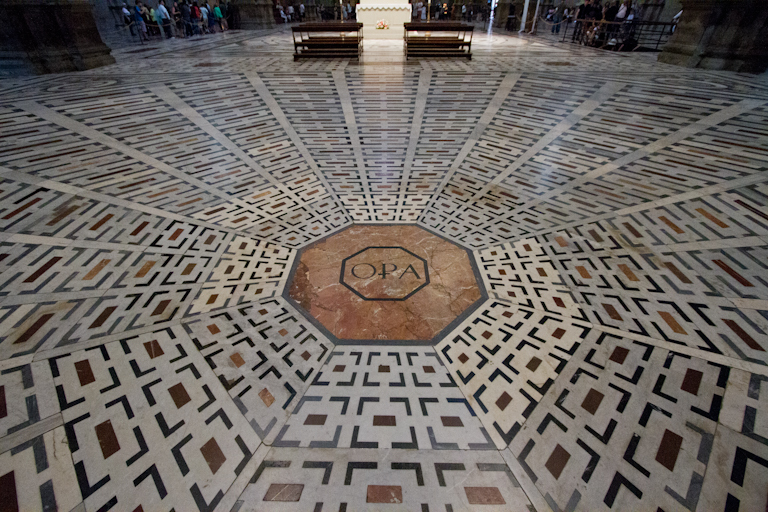 Also buried here is Filippo Brunelleschi, the designer of the dome, being given quite a position of respect being buried with the high ranking bishops. Exiting, next to the church is the bell tower. Our combo pass gets us up here too, so of course we’re going. Well half of us anyway. Or is that a third of us? 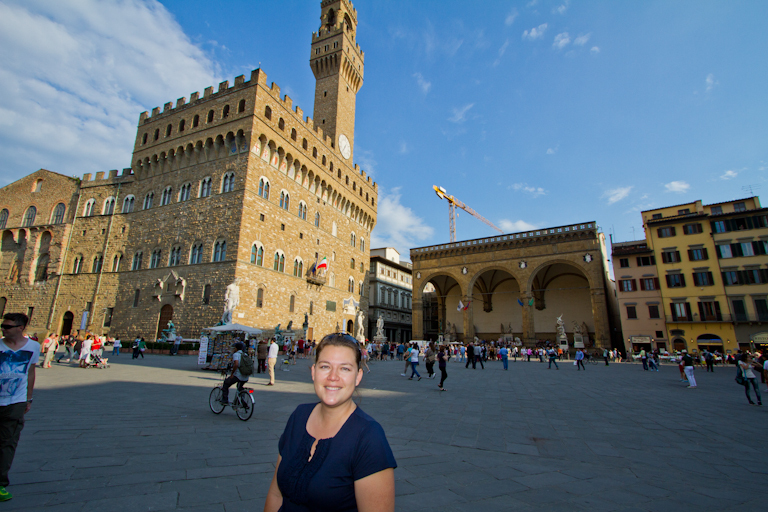 Either way, Theresa decided not to climb the 418 steps up to the top of this 278 foot bell tower and sent me up it with the camera. Looking down at Theresa from the first level. There are 4 separate levels to take a break on. It was also pretty cramped quarters climbing up, so it you met anyone climbing down, you had to both squeeze to the side to get by. Not the best climb if you happen to be claustrophobic. 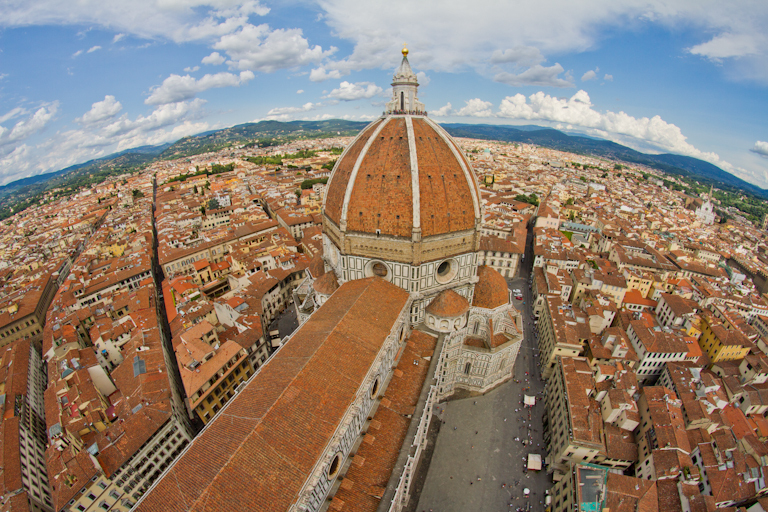 There is also a Dome climb available, which is a few feet higher than the bell tower, but from the bell tower, you get a much better view! 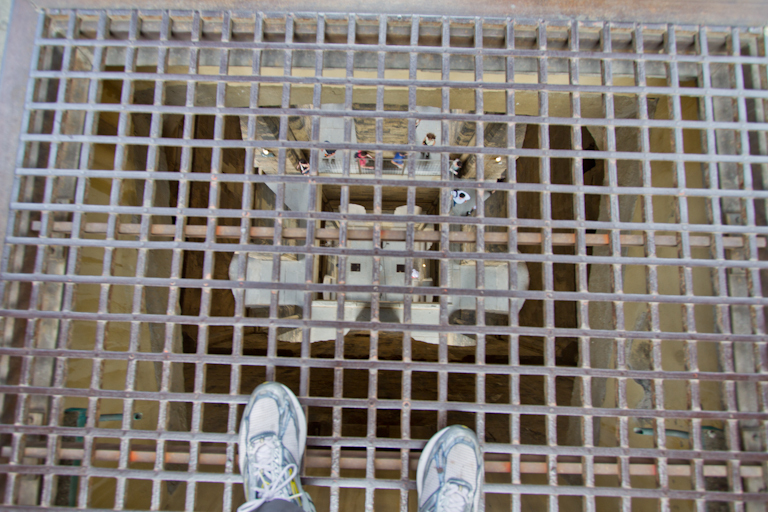 On the third level, there was a metal grate that you could stand on top of and it was just you, the grate, and 150ish feet of air between you and the first level. Some people like me stood on top and took a picture. Others only dared to hold their camera over the edge and point it down. 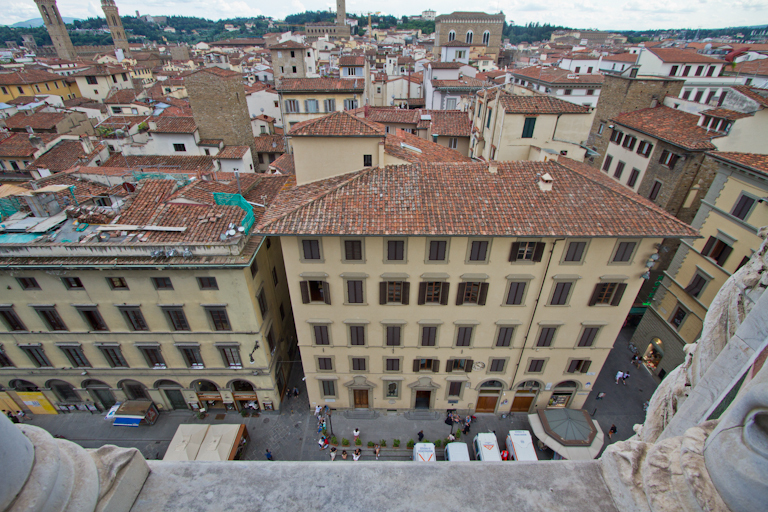 Once at the top, you really can see the entirely of Florence. It’s an impressive view. 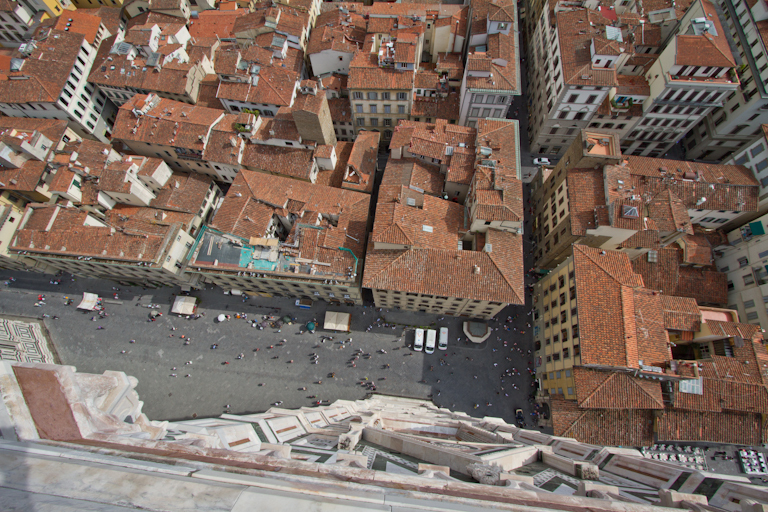 Catching both the Baptistry and the Florence Duomo in one shot. It's ridiculously high up here. 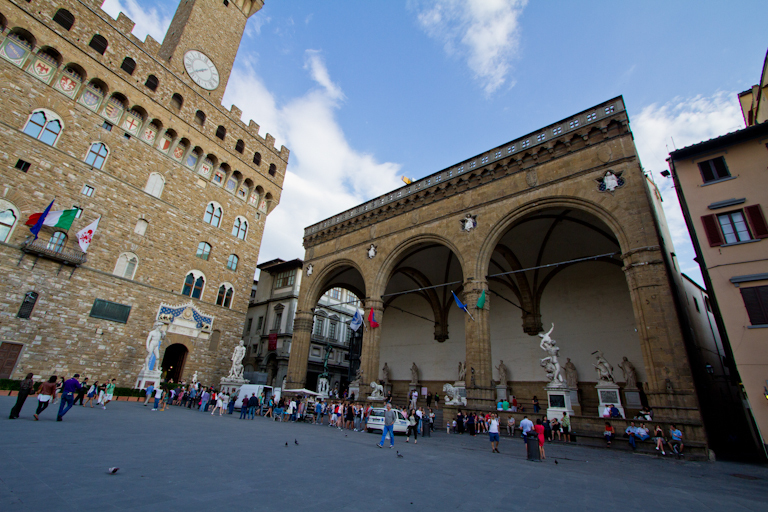 Looking back towards the Piazza de Signoria and Palazzo Vecchio. And using my zoom lens, you can actually see the door to our hotel. Going down is so much easier than going up. No wonder. My camera bag alone weighs over 20 pounds! 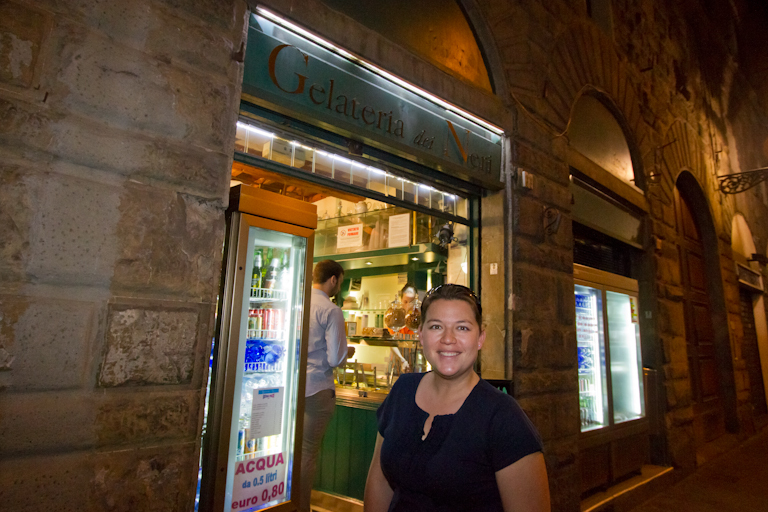 Once on the ground, I didn’t see Theresa and assumed she got out of the sun and went back inside the Duomo. Sure enough, I found her there sitting on a bench. I’m not sure what time it was exactly, but after a few minutes of sitting, everyone was ushered out of the church. Guess it’s closing time. 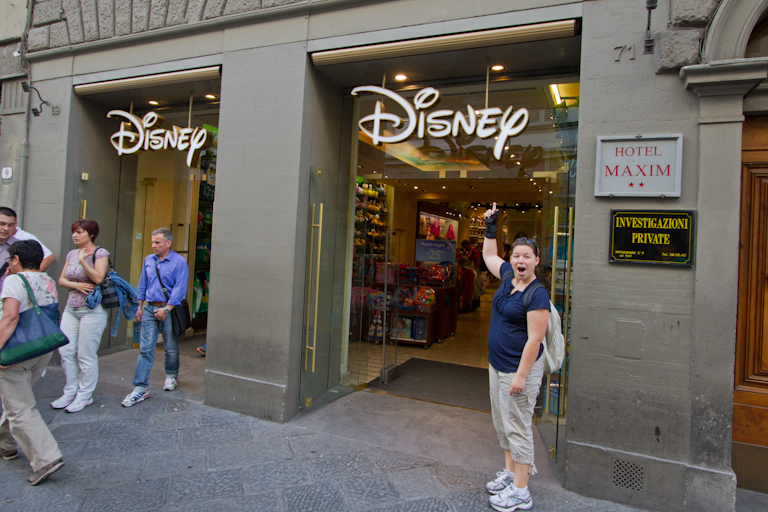 We walked back towards the supermarket and found a Disney store on the way! 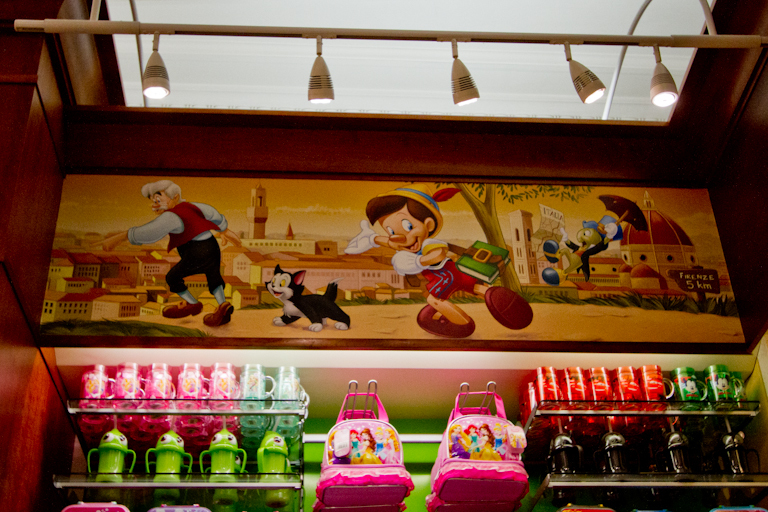 Yay for Disney! 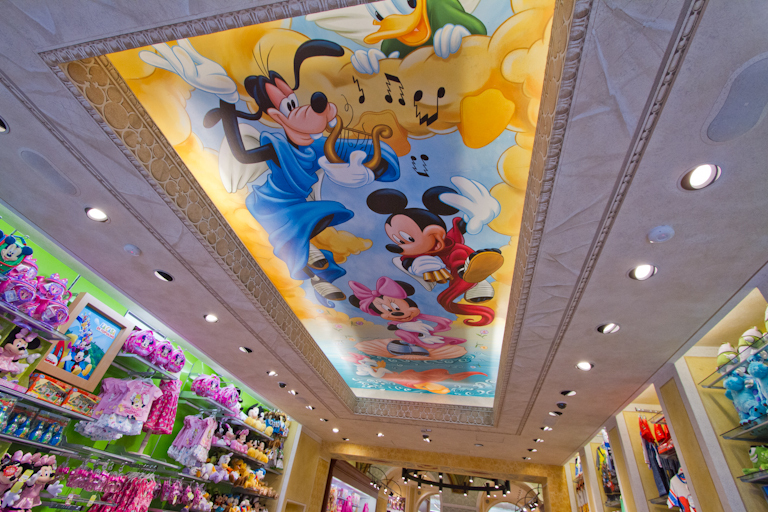 Theresa was excited because she was just now realizing that we’re going to be able to buy lots of fun Disney stuff for our little boy. 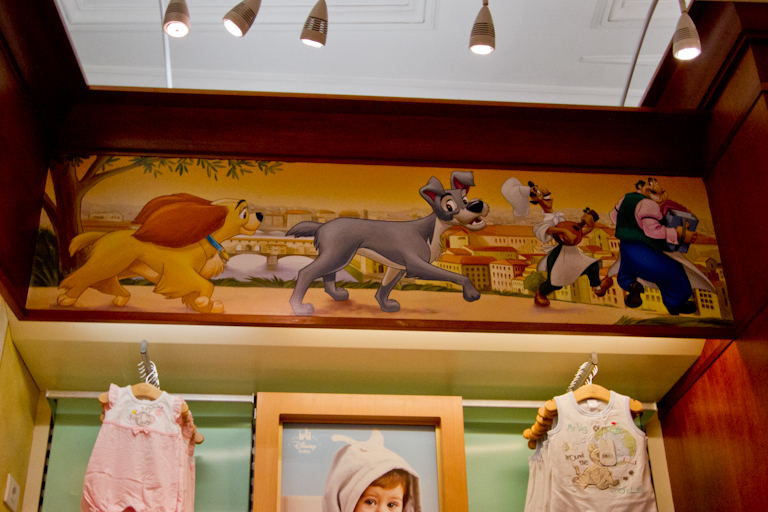 There were some fun decorations in the Disney store as well. 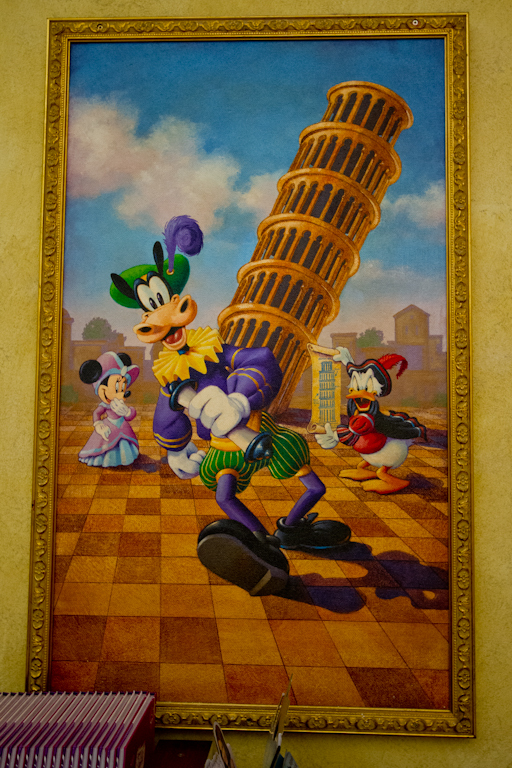 I really like all the Italy specific artwork on the walls. 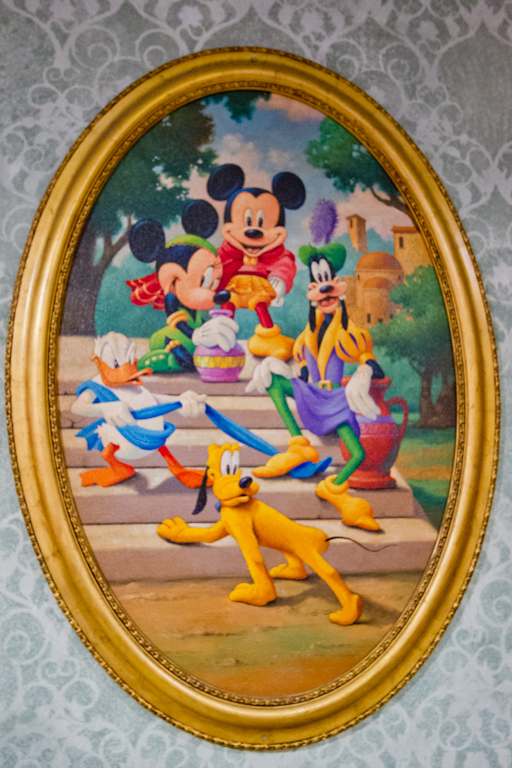 Some of my favorite Disney nephews, Huey, Dewey and Louie, though the colors of their costumes are mixed up. 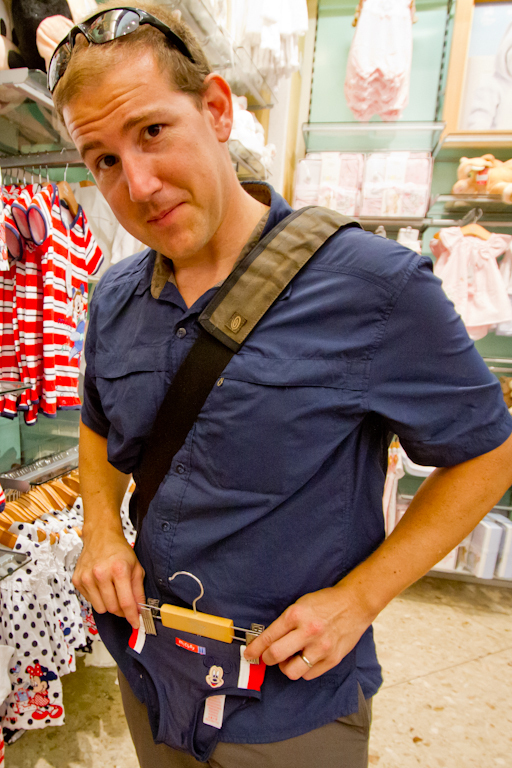 Will this European swimsuit fit me? Whew! 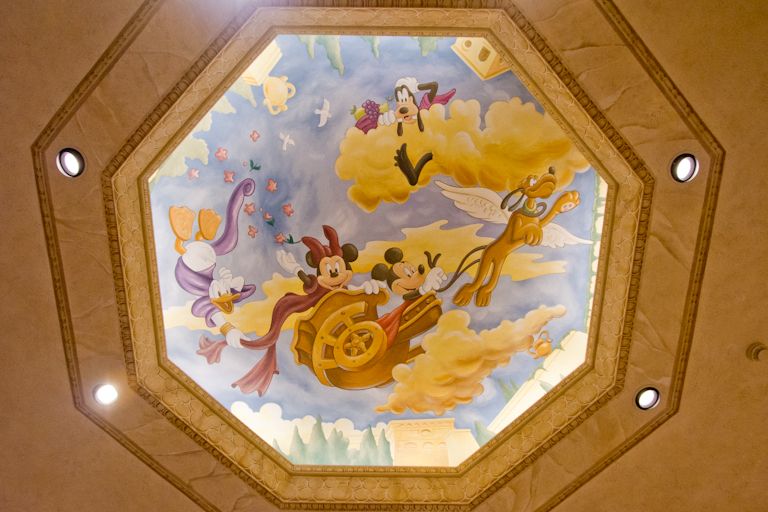 Quite a few Disney pictures there. We made it to the grocery store and bought some drinks, fruit and snacks. We went back inside the hotel to drop off our groceries, looked up the closest laundry facilities headed back out. The laundry place was clean and close. Since we only ever do carry-on, we're going to have to stop and do laundry a couple times on our 2.5 week trip. 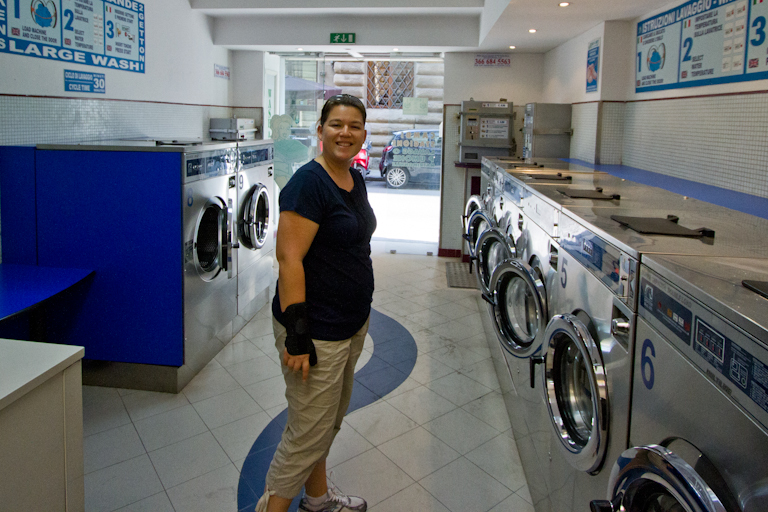 We spent an hour in the laundry facilities doing laundry and reading about all the places we wanted to go during the rest of our time here and what order we were going to do it in. Laundry finished, we headed back to the hotel to drop it off and then out to a late 9pm dinner. 9pm is late by our standards but normal I guess for Italians. Our top two picks that were recommended by Rick Steves which he suggested reservations, you guessed it, required reservations. Even at 9pm it wouldn’t be until 10pm until a table would be free. Our third choice had seats. We started the meal with the most bland bread I’ve ever tasted. It seriously tasted like nothing. We both ordered an appetizer. T got minestrone soup and I *gasp* got bruschetta. After pouring a little balsamic on it, I found it quite tasty. I guess I like raw tomatoes now. 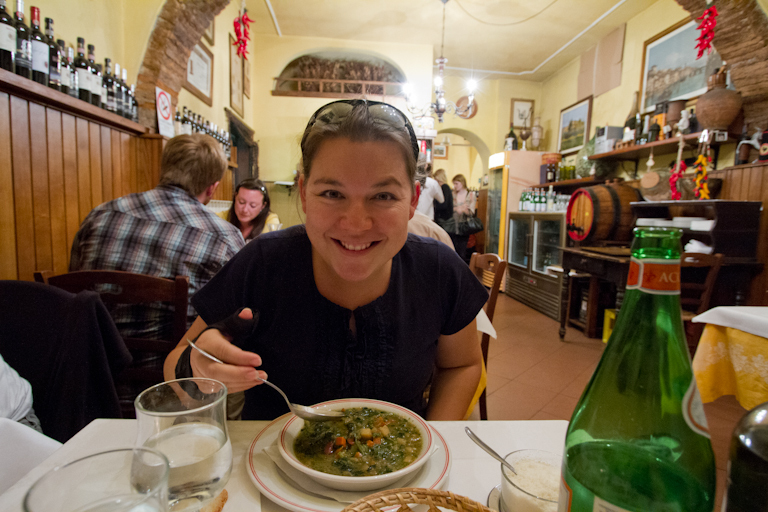 T also enjoyed her soup, and I did as well. After the appetizers, we had high hopes for the rest of the meal. 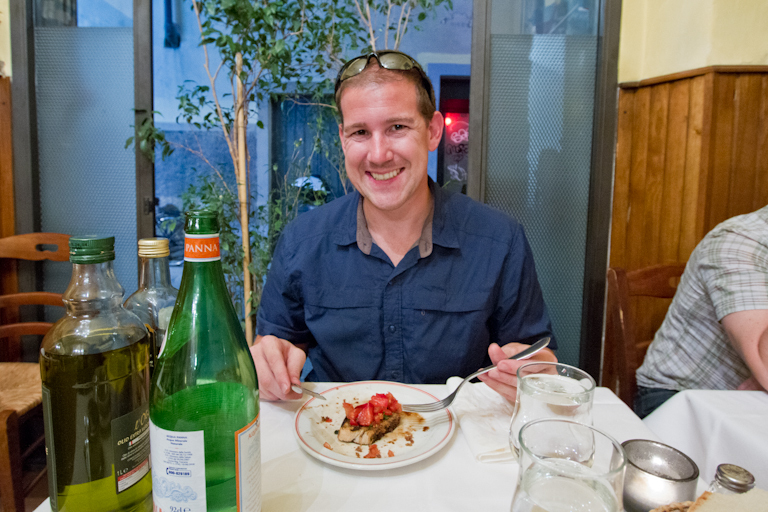 I ordered the filet of beef in a balsamic sauce, while T got a tomato, basil, garlic pasta. 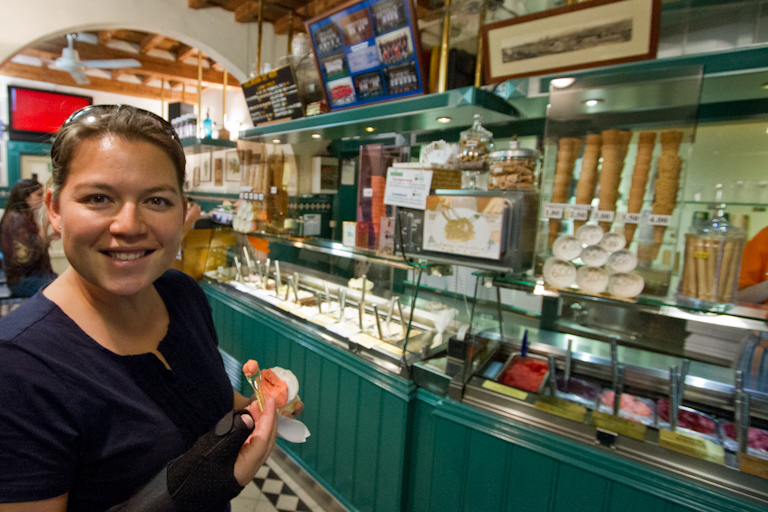 She thought her pasta was just okay, but even being okay, it was better than any other pasta she’s had here in Italy so far. My “filet” turned out to be a thin strip steak. They didn’t ask how I wanted it cooked, which should have been a clue I suppose. I wasn’t impressed by the steak or the sauce. Oh well. 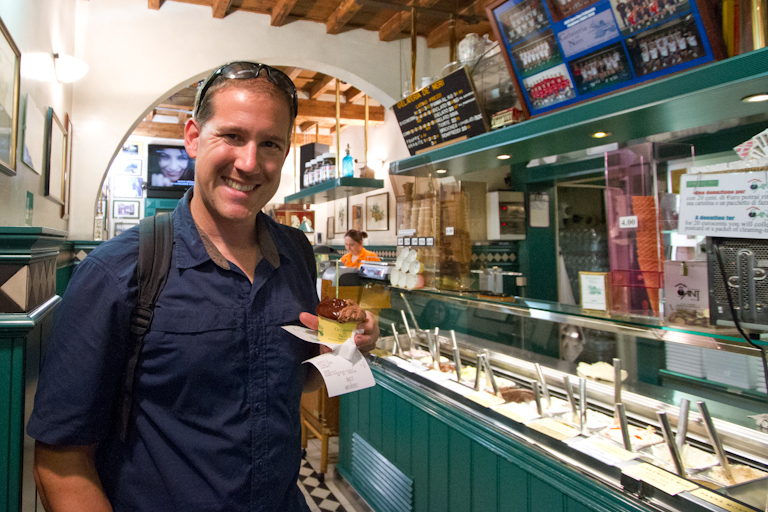 Of course we’ve got to finish the night with gelato. A Rick Steves recommended place is just around the corner. 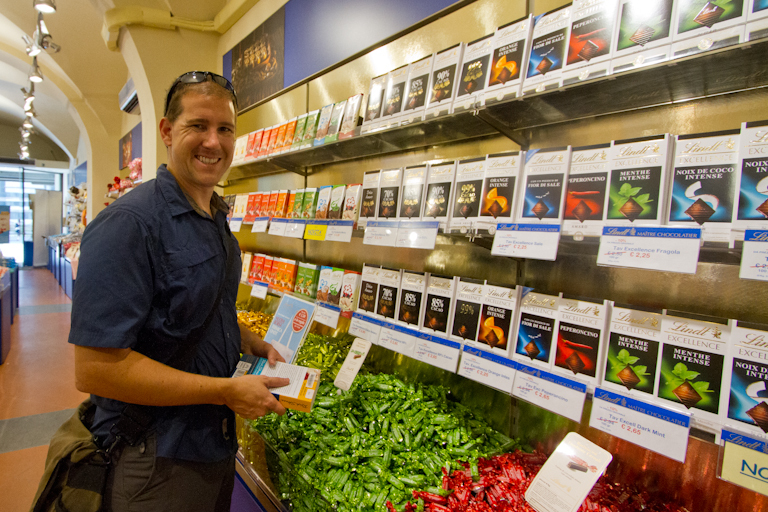 They boasted 10 different kinds of chocolate with 0 descriptions that I could read, plus a bunch of fruit flavors and others. T got a lemon and strawberry and mixed the two. The lemon by itself was very tart, but mixed with the strawberry became delicious. I chose a coconut, plus 2 kinds of chocolate and I don't know what they were. I just asked her to pick for me and she did a good job. It was a short walk back to the hotel and we’re in for the night now. After showers, we’re just winding down. The bell in the church close by just struck one. We’ve got quite a few things on the agenda tomorrow so we’ll see what time we roll out of bed and get everything started. Either way though it should be fun! Great blog! 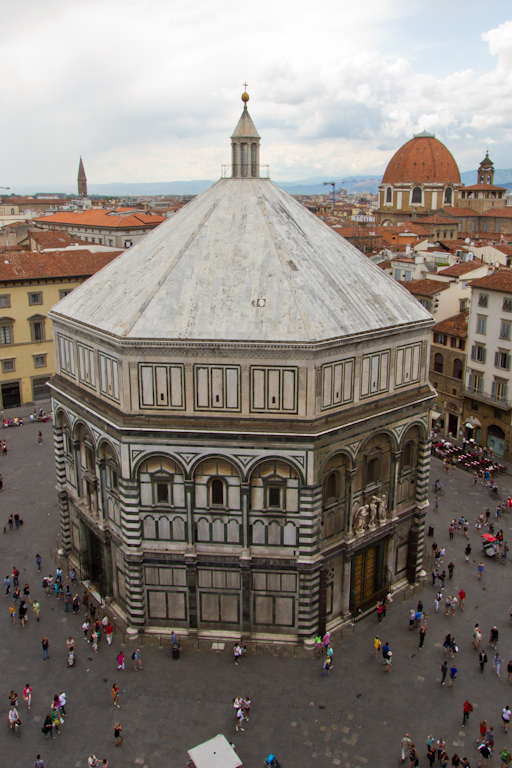 Are you able to tell me how long it took you guys to do the Great Museum of the Duomo: the Cathedral of Santa Maria del Fiore with Brunelleschi's Dome and the crypt of Santa Reparata, the Baptistry of San Giovanni, Giotto's bell tower and the Historical Museum in total? Any thoughts would be greatly appreciated. Hi Kendra. I'm glad you enjoyed reading it. Let's see. 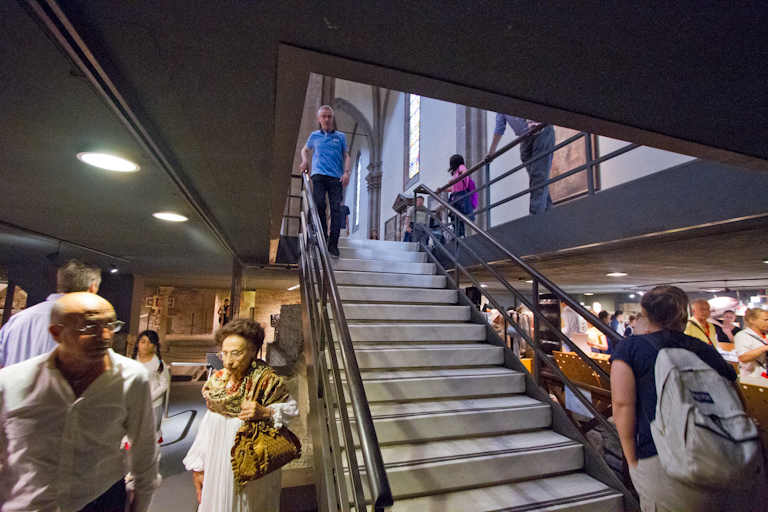 We started with the Historical Museum around 2pm and spent a little over an hour there. Next was the Baptistery at 3:15pm. After 25 minutes there, we went into the Cathedral at 3:40pm. 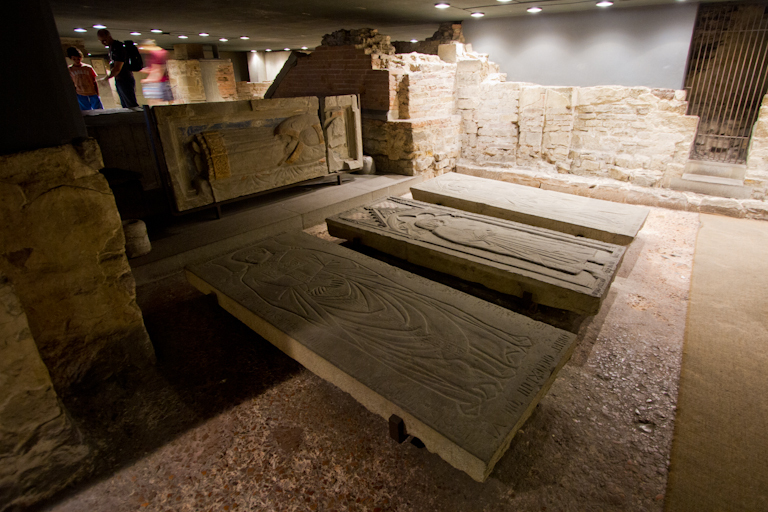 After a quick walk around the main floor, we went to the crypt at 4:00pm and spent 15 minutes there. 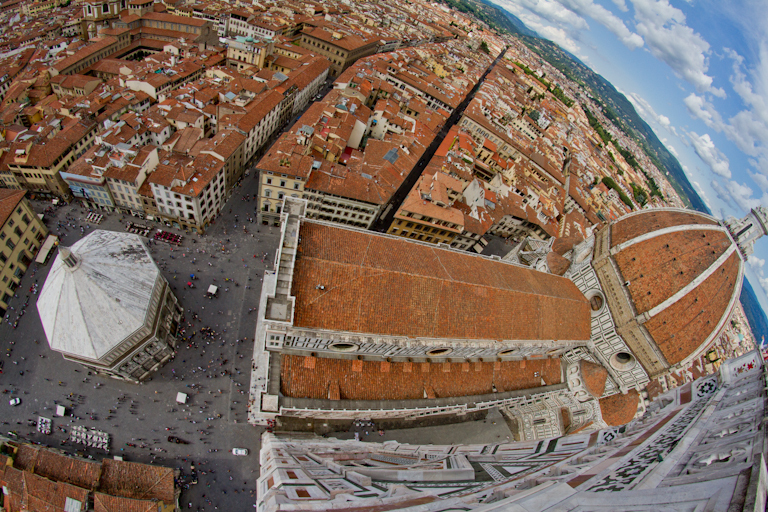 At 4:15pm, I climbed the Bell Tower and spent close to 45 minutes there. 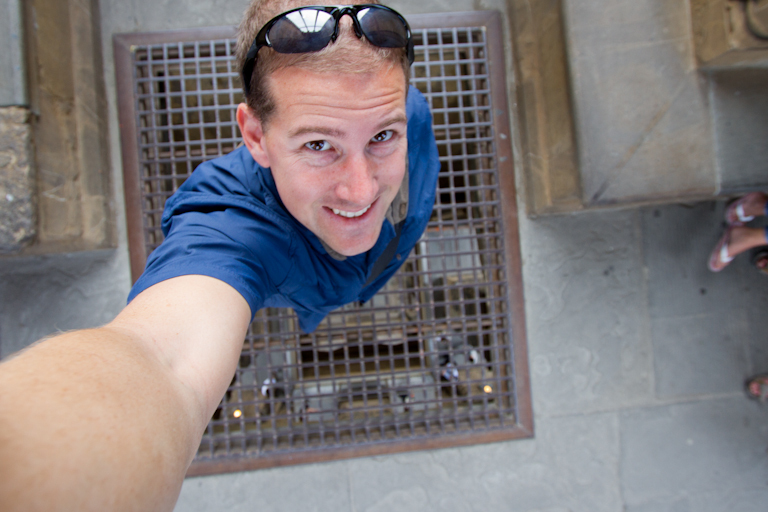 The only thing I didn't do was climb Brunelleschi's dome. By the time I came down from the bell tower, the cathedral was closed for the day. The pass we had was good for 24 hours, and I could have come back the next day, but we ended up doing other things and I didn't get the opportunity. You could certainly spend much more time at all these places, but we knew we had a limited amount of time and wanted to see as much as possible.